The LA Times recently wrote an article about the contentious battle between LAUSD neighborhood schools and the corporate-sponsored charter schools that are attempting to co-locate onto our campuses. The article focused on Excelencia Charter Academy co-locating onto our neighborhood Sunrise Elementary School campus here in Boyle Heights. 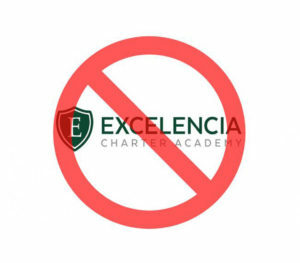 However, the author, Howard Blume, left out many important details about our efforts to stop Excelencia Charter Academy’s attempt to co-locate onto our campus. As a teacher at Sunrise, I am here to set the record straight. We as Sunrise staff let the founder and Board of Directors of Excelencia Charter School know that our community opposed the co-location six months before they took possession of our space. Over 400 signatures were delivered to their Board meeting in March. Also in March, over 80 parents, teachers, students, and community members marched on a rainy day to protest the loss of school resources. Then in April over 30 parents, teachers, students, and community members attended their Board of Directors Meeting to demand that they not co-locate. At that time, over 900 signatures were delivered to their founder and the one Board of Directors Member who was physically present. UTLA filed a cease and desist letter citing multiple violations of the Brown act, including the circumstances of the co-location vote. The community and the neighborhood school were opposed to the co-location, and Excelencia chose to co-locate anyway. Excelencia Charter Academy did not have to co-locate at a neighborhood school. It is not a requirement for new charter schools. All charters have the option to secure their own rented space, and many of them do. Excelencia’s founder could have rented a space in East LA where he says he originally applied for the charter. He chose not to. The students of LAUSD should not have to bear the burden nor expense of one man’s business endeavor. Now this co-location is wreaking havoc on our neighborhood school. In order to make seven rooms available to this new business endeavor, our existing programs and classrooms had to be relocated. 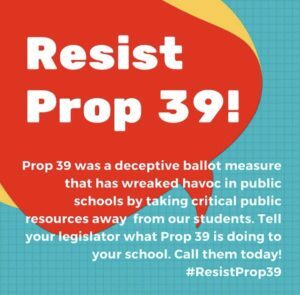 Many people justify co-location by citing state law, Proposition 39, which allows charter schools to request space on LAUSD campuses. However, the article does not clarify that “unused space” is defined by the district as any classroom that is not used by a register-carrying teacher. This leaves many of our school resources, such as the parent center, science labs, art rooms, music rooms, special education therapy rooms, and computer labs vulnerable to co-location. LA’s Best (the after-school program that services our students here at Sunrise) lost the room they used as their central office. Our Theater teacher lost a room that was used for theater class. Our Speech Therapist had to be relocated to another classroom. Our three computer labs had to be dismantled. Eight of our teachers had to be relocated to accommodate the rooms lost to the start-up charter. 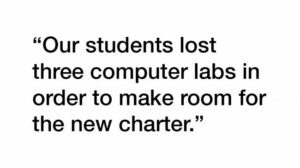 Our students lost three computer labs in order to make room for the new charter. These had to be dismantled in order for the new school to take up residence. We at Sunrise Elementary School lost a vital resource as these computer labs provided daily instruction on blended learning programs as well as much needed practice for students who do not have the same technology at home. This practice is even more vital when you consider that students must take the state mandated test, SBAC – Smarter Balanced on the same computers. Having lost 3 computer labs, what will this process now be like for our neighborhood school? Furthermore, when a new charter school co-locates on an existing LAUSD campus, they do so at great expense to taxpayers. While charters pay a nominal fee, they are given brand-new furniture, desks, and chairs. What, is our existing furniture not good enough for them? They are provided with brand new rugs, bookcases, storage bins, and teacher desks. 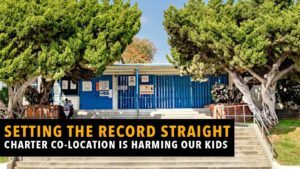 We as neighborhood schools lobby against co-location because we have seen time and again that resources at our neighborhood schools are lost while LAUSD caters to the demands of the charter school industry. Excelencia’s founder says that his school is needed in order to provide a “high-quality alternative” to our neighborhood schools. Very few people would call a school with uncredentialled administrators and inexperienced teachers a “high-quality alternative”. What he and other charter operators fail to tell parents is that unlike LAUSD school administrators, charter leaders do not require a California School Administrators Credential. They do not inform parents that charter teachers do not require California State Credentials, and many times they lack basic background checks required of all LAUSD personnel. Here’s what I would say to the pro-charter school board members, Excelencia Charter School, and charter schools throughout LA: Respect the CHOICE of the community when they CHOOSE their neighborhood school.